The construction of the building started in 1987 and it was completed a year later. 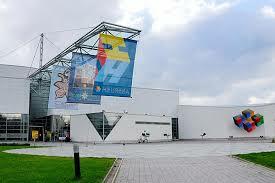 The overall area of the building is 8,200 m2, of which 2,800 m2 is exhibition space. In the building there is a digital planetarium with 135 seats. Heureka has roughly 300 000 visitors per year. There are around 200 main exhibition houses related to different fields of science. Here is our experience from the exhibition. When we entered the building we were greeted by an employee. His name is Sami and he’s 26 years old. He has been working at Heureka for almost half a year now and has really liked his job as a tour guide. We asked him why the exhibition area so small compared to the whole actual size of the Heureka building and what they use the remaining 5,400m2 for. As we asked the question Sami started laughing nervously and wiped sweat from his forehead. When he finally got to answer he started to show us some magic tricks which distracted us completely. We were quite impressed by his performance. When he broke his magic equipment we decided to ask him if the conspiracy theories about a secret Russian reptilian underground base were true? “Hah, well that I can tell you…” Sami said as he started doing a series of backflips and then flew out the window. We ran surprised to the window and saw Samis clothes on the ground. We looked up and saw a reptilian float up to the sky into a hovering spacecraft. He still had underwear on. The spacecraft had some Russian symbols painted on it and was playing Russian hardbass as it flew away. This experience was quite eye-opening, but the price of 22€ is still fairly expensive. We were a bit disappointed at the customer service because our tour guide left us alone. All of the other employees at Heureka had also disappeared mysteriously. We went to the toilets, took our stuff and went home. This story may not be 100% accurate.